BREAKING NEWS! All Correll Products ship FREE anywhere in the lower 48 states! These tables have been designed for the heaviest use. All tops are 1 1/4" thick, real High-Pressure Top, for long life and durability, not Melamine as used on some of the cheaper tables. Correll was established in 1969 as a manufacturer of quality mid-market facility tables and seating. Over 95% of all products are made in the United States, specifically at their Charleston Arkansas factory. 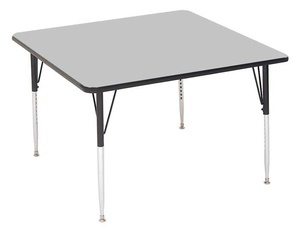 Correll continues to develop new quality tables and chairs from materials such as ABS plastics, wood, and steel. New to their product line are blow-molded tables featuring an anti-microbial surface providing homogeneous protection throughout the structure of the top material, not just the surface.